Scientific study is the first to investigate weekly on-site Legionella DNA testing. The Spartan Legionella Detection System is the world’s first on-site Legionella DNA test. PSPC is a leader in Legionella testing and management. This is the first scientific study of weekly Legionella DNA testing and we are grateful for PSPC’s support. It is an excellent example of how the Canadian government supports innovation. - Paul Lem, M.D., CEO of Spartan Bioscience. Spartan Bioscience today announced scientific results from a Legionella testing study of Canadian federal government buildings. The 12-week study tested 51 cooling towers in Ottawa, Toronto, and Montreal and compared weekly on-site Legionella DNA testing vs. monthly Legionella culture testing. Legionella DNA testing was performed with the Spartan Legionella Detection System, the world’s first on-site Legionella DNA test for buildings. The study was designed and performed in collaboration with Public Services and Procurement Canada (PSPC). PSPC was one of the world’s first organizations to adopt rigorous Legionella testing standards and has been at the forefront of proactively protecting public health by incorporating new technologies and standards. Funding for the study was provided by the Build in Canada Innovation Program (BCIP). The study’s main finding was that 39% of cooling towers tested positive for Legionella DNA levels greater than 10 bacteria per milliliter and 8% of cooling towers tested positive for Legionella DNA levels greater than 100 bacteria per milliliter during the study period. To put this in perspective, Quebec regulations call for cooling towers to be disinfected when the Legionella level is greater than 10 bacteria per milliliter. Similarly, the action level is 20 bacteria per milliliter in New York State. Second, weekly on-site Legionella DNA testing was able to rapidly detect when Legionella bacteria grew to a higher action level. The doubling time of Legionella bacteria is typically between 22–72 hours in water systems and the natural environment. (2) However, the doubling time at an “amplifier site” (such as a cooling tower) can be as few as 2.5 hours. (3) Overall, weekly testing is important because Legionella can reach high levels within days. Spartan plans to publish more detailed findings from the study in upcoming peer-reviewed scientific publications. Legionella is a common environmental bacterium that can infect the cooling towers of Heating, Ventilation, and Air Conditioning (HVAC) systems of large buildings. Infected cooling towers release aerosolized water droplets contaminated with Legionella into the surrounding air. Building occupants who breathe in these water droplets can develop Legionnaires’ disease, a potentially fatal pneumonia. Legionnaires’ disease symptoms can include coughing, shortness of breath, chest pain, and nausea. The Spartan Legionella Detection System is the world’s first on-site Legionella DNA test and it can detect and quantify Legionella bacteria in 45 minutes from a water sample. The system consists of a coffee-cup-sized, portable DNA analyzer called the Spartan Cube® and a single-use disposable test cartridge. The technology is based on a highly-accurate Nobel-Prize winning chemistry called quantitative Polymerase Chain Reaction (qPCR) and it is designed to meet the objectives of ISO/Technical Standard 12869:2012. Spartan’s system is the winner of the 2018 AHR Expo Innovation Award for Indoor Air Quality, as judged by the American Society of Heating, Refrigerating and Air-Conditioning Engineers (ASHRAE). Spartan Bioscience is the leader in on-demand DNA testing. (7) Spartan’s technology fully integrates DNA collection, extraction, and analysis, with an intuitive interface that is easy to operate. 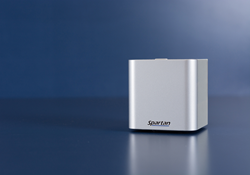 The Spartan Cube, the world’s smallest DNA analyzer, enables unprecedented portability and convenience in applications such as infectious disease, pharmacogenetics, and food and water safety testing. 1. French Ministry of the Environment. (2006). ARIA. No. 19456. 2. Marshall AG, Bellucci EC. (1986). Hospitality Review. 1(4): Article 2. 3. Lucas CE, Taylor TH, Fields BS. (2011). Water Res. 45(15): 4428–4436. 4. Benin AL, Benson RF, Besser RE. (2002). Clin Infect Dis. 35(9): 1039–1046. 5. Centers for Disease Control and Prevention (CDC). (2011). Morb Mortal Wkly Rep. 60(32): 1083–1086. 6. Centers for Disease Control and Prevention (CDC). (2010). Waterborne diseases could cost over $500 million annually in U.S. July 14. 7. Roberts JD et al. (2012). Lancet. 379:1705–11.